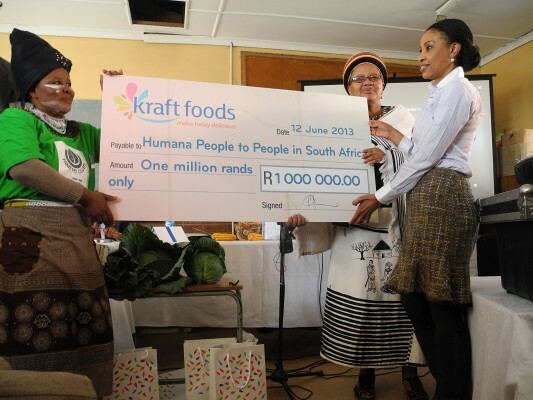 Kraft Foods South Africa, a member of the Mondelēz International group of companies, has reinforced its flagship sustainable agriculture project by contributing a further R1 million to Humana People to People South Africa, a non-profit organisation. 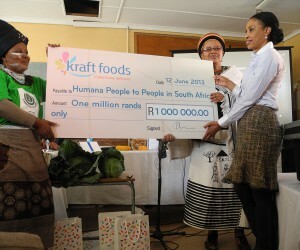 A year ago, Kraft Foods donated an initial R1.8 million to Humana as part of a three-year phased donation to the organisation. The funding is in keeping with Kraft Foods' global corporate social responsibility programme, which provides support in Africa in three key areas: hunger and poverty alleviation, healthier lifestyles and sustainable agriculture. Pat Senne, Kraft Foods' director of Corporate and Government Affairs for Southern and Central East Africa, said the outreach programme to the Mbashe Municipality in Amathole District, one of the poorest areas in the country, was making progress. To date, two Farmers' Clubs in Qinqana North and Qinqana South – each with 200 farmers – have benefited from the project, which is led by Humana personnel living among the farmers. The farmers have benefited from training sessions, and technical and personal assistance in a skills-transfer programme intended to empower subsistence farmers by offering access to organised club life. “I’m delighted to report that food gardens – an important component of the project – are going a long way toward alleviating hunger in this community,” Senne said, adding that farmers are managing to support an average of eight people per family. Maize is being produced in large volumes, while vegetables – including spinach, beans and green peppers – are being farmed on a smaller scale. Produce is sold to the local Mpakama School and the surrounding community. Presenting the cheque to Niels Matthiessen, Humana’s country director, Senne said that the contribution of R1 million will be used toward the ongoing development of the Mbashe community by enabling new projects, and continuing skills development and healthy-lifestyle education to mitigate the impact of HIV/Aids and tuberculosis in the area. The additional funding will be allocated toward installation of rope pumps, a borehole and irrigation tanks, as well as training farmers in the maintenance of water pumps.